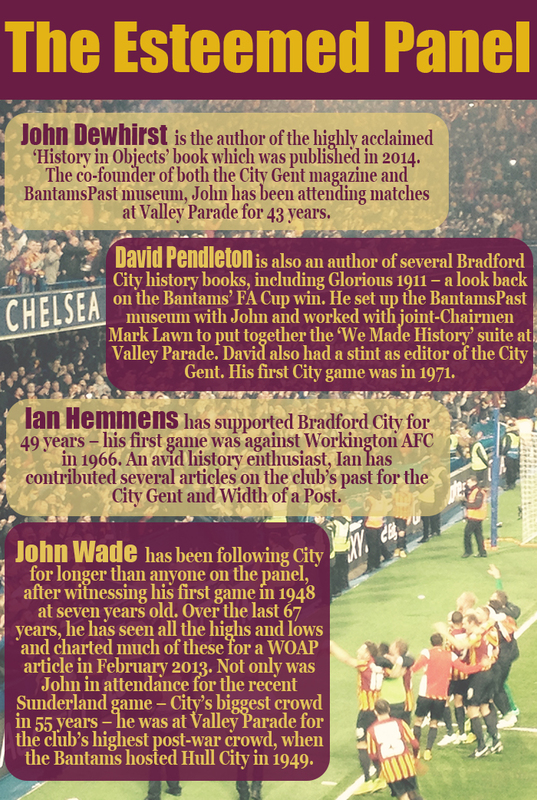 Continuing from part one, WOAP has put together a panel of long-serving supporters – John Dewhirst, David Pendleton, Ian Hemmens and John Wade – to find out how the current era of success compares to Bradford City’s historic achievements. If you had to name the greatest all-time City team, based on ability, the 2000/01 Premier League relegation side would arguably take the crown – but no one looks back upon that team with fondness. What turns exceptional players into legends are their achievements and contributions irrespective of ability – so with that in mind, do players from the 2012/13 and 2014/15 teams belong in the same bracket as McCall and co? And what about the club’s current longest-serving player, James Hanson? Is he now a Bradford City legend? “If his thumping header at Villa Park, or that looping effort that opened the scoring in the play-off final isn’t enough to place him in the all-time great bracket, I don’t know what will,” stated David. John Wade added, “James Hanson is difficult to categorise yet. He seems a sort of talisman, just as McCall and Bobby Campbell were. When Campbell came back to City, they immediately started winning. McCall, of course, is the top man. 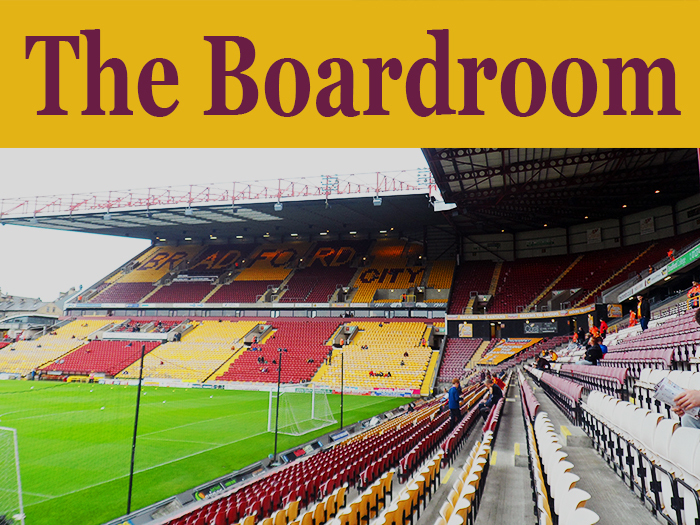 Bradford City have had many owners, good and bad. Often there is a split amongst supporters over the job that those in the boardroom have performed, and Mark Lawn and Julian Rhodes have certainly attracted a wide range of viewpoints over their time at the helm. “Personally, I think we should be pleased that we have two people running the club who are ‘fans’ and are, in this day and age, cautiously prudent when running the club,” offered Ian. “Another period of administration would surely kill the club, so we should be happy with the legacy they are building. David pointed to the ongoing season ticket initiative as the pair’s true legacy. “As a double act, the pioneers of affordable ticket pricing. I deliberately say affordable rather than cheap. 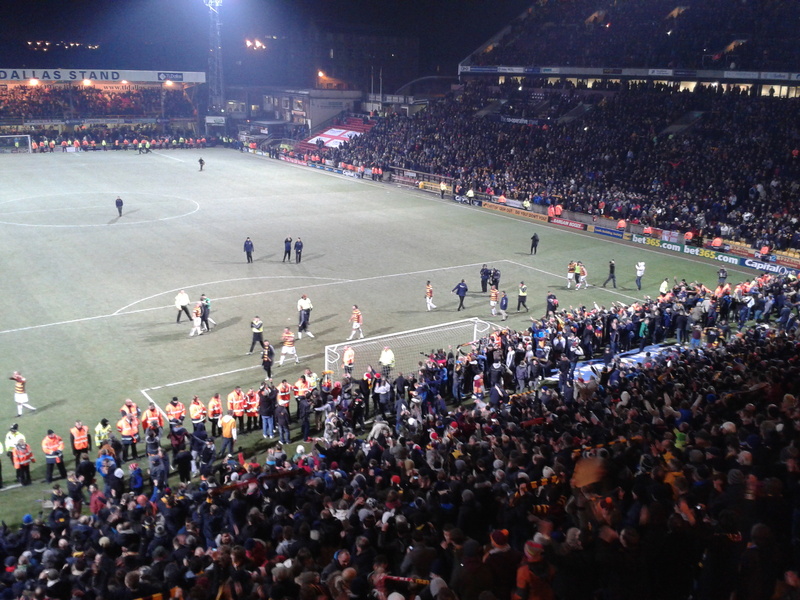 It is one of the vital elements that have made Bradford City one of the stand-out clubs in modern football. “It is wonderful to see that policy reaping rewards, both in terms of attendances and plaudits from the world of football. You will always get the supporters who say we should charge more for our season tickets, but that would be a hugely retrograde step. It would make us just another football club, indistinguishable from the other ninety-one. “The pricing for the Sunderland FA Cup tie was part of the reason why we ultimately won. Let any fan tell me that the atmosphere created didn’t make them proud to be a City fan? I’m old enough to remember City ramping up the prices for the 1976 quarter-final against Southampton. The increased prices meant that the match didn’t even sell-out. We would do well to remember that lesson from history. “Regarding Mark Lawn and Julian Rhodes as individuals: although the Rhodes family were partly responsible for our rise and fall of the early 2000s, they have stuck with the club and by doing so have absolved themselves ten times over from any acrimony from the Richmond years. As the momentous events of 2013 unfolded, I was delighted that Julian and his family were still at the helm to witness the Wembley visits. John Dewhirst praised the stability that the pair have brought to the club, but questioned the club’s financial limitations in the long-run. “From an historical perspective they have provided relative stability and better the devil you know – we don’t have the worry about the motives of an unknown foreign owner with little sympathy for local sensibilities. At the end of the day we know where they stand. A striking feature about the last few years has been the bond between the players and the crowd. Social media has undoubtedly helped to bring the two closer together, as has the way in which supporters get behind the team during matches. 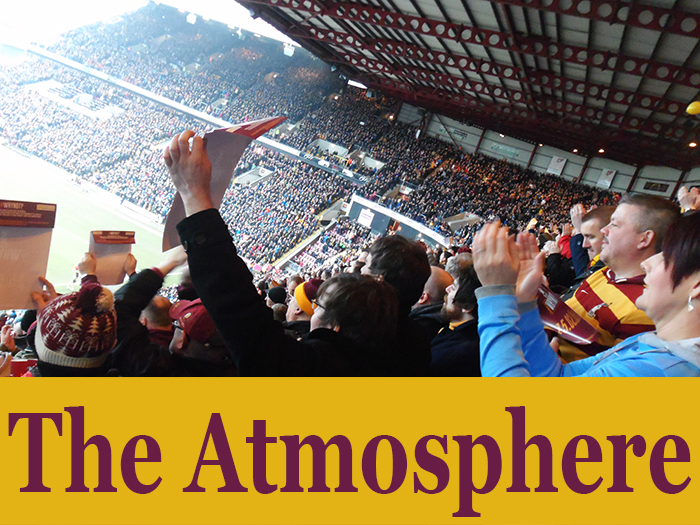 John Dewhirst agrees that the current atmosphere is “unprecedented”, adding, “A big part of the recent atmosphere has been the fact that the new Valley Parade has been full to capacity, the sheer size of the crowd vs Sunderland was notable. “A big difference this season is that there has been atmosphere in each end of the ground and the main stand has lost its inhibitions. In a historic context, what is different is the proportion of families and women in attendance. Frankly, it is a far more civilised atmosphere. “I saw a photograph from the Sunderland game of a packed Valley Parade and it immediately reminded me of photos I had seen of games against Burnley in 1960 and 1911. It felt great to know that I had finally seen a respectable, capacity crowd and been part of it. You no longer need historical photos of a packed Valley Parade. David views the bond between players and supporters to be different to past eras, but special in its own modern way. “The world has changed. 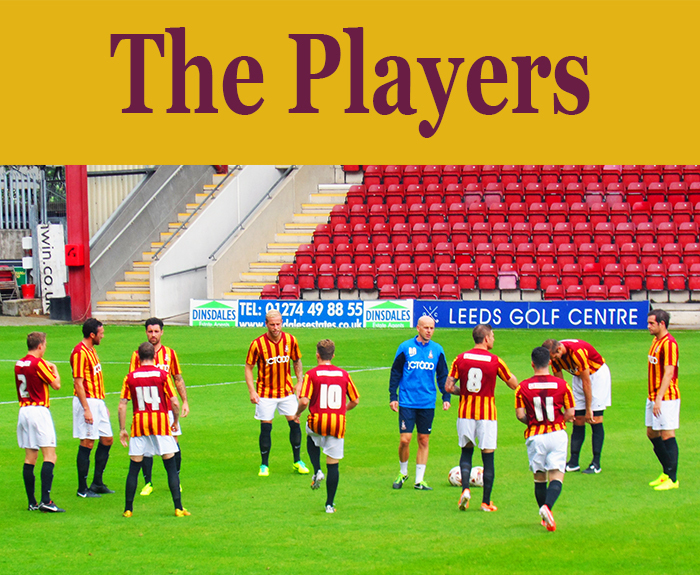 The players don’t travel to the ground by public transport anymore, most don’t live in the city of Bradford. Whereas the 1980s teams would regularly be out on the town on a Saturday night, today’s players are expected to be more, shall we say, ‘professional’. “Conversely, via Twitter and the like, the players can actually come closer to thousands of their supporters. They can share their elation or frustration in an instant. It is too early to talk about the legacy of this period, but Ian is in no doubt that these modern times will form part of the club’s heritage, which younger supporters will grow up re-telling. “When I was a young lad a few of my friends were all Leeds fans purely due to their success and they would taunt me about ‘What have City ever done?’ I could point with pride to a FA Cup win before Leeds United even existed. “The present team under Phil will have the same effect for young City fans now – they will pass on stories of their exploits to their children and grandchildren. With special thanks to Fliss Cater for her design skills. With regard to the atmosphere – I was talking to the referee’s assessor from the game against Sunderland recently. He stated he had not heard an atmosphere at a ground like it for years. When the chorus of “We’re the Bradford Boys making all the noise” boomed out from 3 sides after the first goal he felt the hairs on the back of his neck stand up. In the post match de-brief, he said all the officials stated they had never heard that much noise when they are in the Premier League – which anyone down at Chelsea would concur with. I don’t think the Arsenal game was the catalyst for the change. In my opinion, it was the last ten minutes and extra time of the Burton league cup game; the “its only a cup…” song was almost a flippant response to a poor first half. However, the fightback and subsequent draw with wigan was the catalyst. Again, i think pricing was a factor. At £10 per ticket, for a city fan you couldn’t afford to miss a game snd being in amongst that 5,000 strong Bradford Army at the DW was spine tingling, a band of brothers bonded on the turf and in the stands by 120 minutes of stubborn resistance; and its this stubborness started in the burton game (you could arguably mention watford) is what we fans have connected with the most in my opinion. 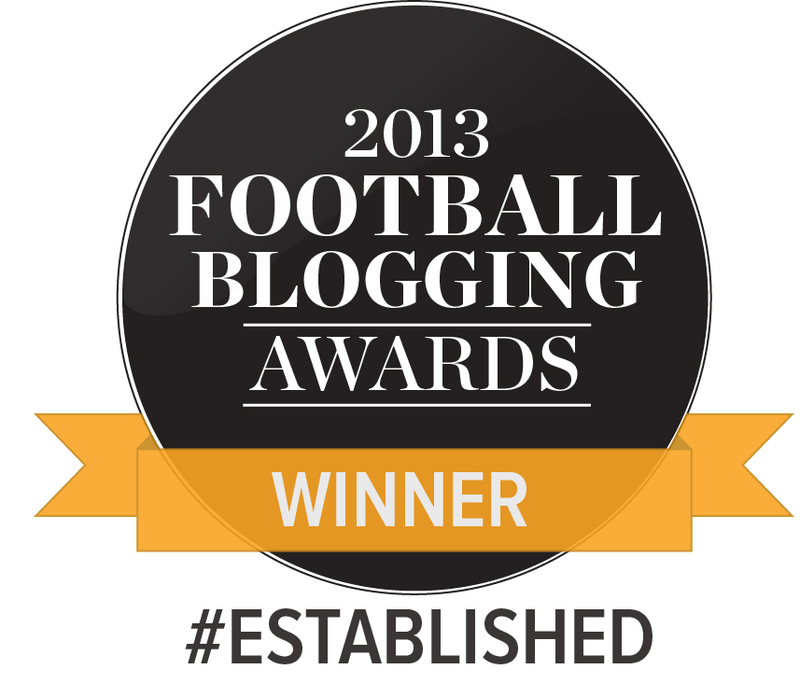 We are Bradford City, we will not be beaten.